Over the course of its near fifty-year history, Athlone Institute of Technology has established itself as a centre of academic excellence and applied learning. As an institute, it has gone from strength to strength with its alumni powering some of the largest companies in the world, including Boston Scientific, Ericsson, Intel, RBK, PPD, Mergon and Neueda. Companies like these have long recognised the calibre of AIT graduates, valuing them for their talent, technical ability and work-readiness. This week, another cohort of graduates joined their ranks. Over the course of two days, 1,804 undergraduate and 132 postgraduate students were conferred with awards, of those students, 15 undertook their postgraduate education by research mode. Athlone Institute of Technology was also delighted to confer seven PhDs, five within the Faculty of Engineering and Informatics and two within the Faculty of Science and Health. One such graduate, Dr Yuanyuan Chen, also won the institute’s inaugural ‘Women in Research’ award for her contribution to the scientific canon in the area of interventional cardiology. Supervised by Dr Declan Devine, director of the Materials Research Institute within Athlone Institute of Technology, Dr Chen developed breakthrough bioresorbable scaffolding which can be placed in clogged coronary arteries to increase blood flow to the heart. Dr Chen’s invention, made from a unique blend of PLA polymer, is 3-D printed in-house and is intended to dissolve in the body after it has fulfilled its function. 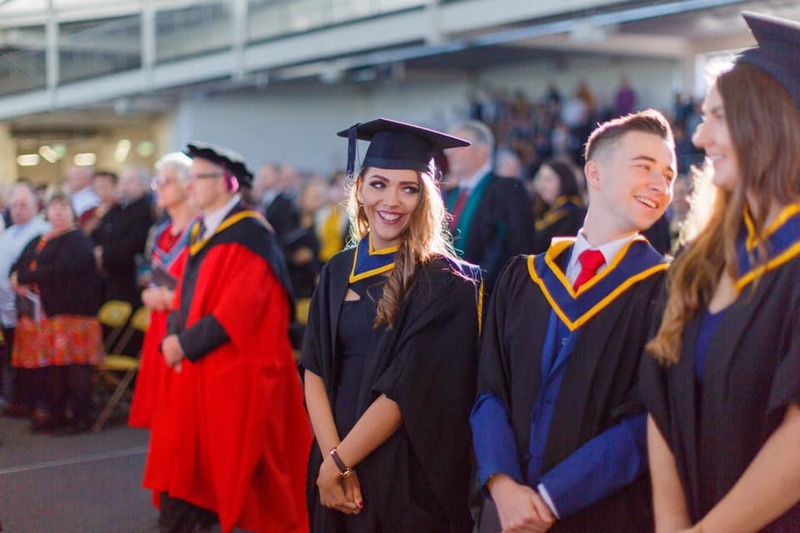 During the ceremonies, President of Athlone Institute of Technology, Professor Ciarán Ó Catháin gave a rousing and inspiring graduation speech in which he congratulated the recent graduates on their achievement and touched on an issue close to his heart – mental health. “Ireland is in the grip of a mental health crisis with 1 in every 10,000 young people losing their lives by suicide. Our students today will be our future business leaders, entrepreneurs, engineers, IT specialists, medical and pharmaceutical developers, nurses, social care workers and politicians so it is vital that they are looked after. An investment in our students’ mental health and well-being is an investment in the future of our country,” he finished. The 2018 conferring ceremonies also saw the bestowal of the institute’s 21st Distinguished Fellowship award to Rita Shah, a successful Indian entrepreneur whose innovative company, Shabra Group, has become the byword for recycling in Ireland. The Distinguished Fellowship is the institute’s highest honour and is bestowed upon individuals who, through active leadership have made significant contributions to society, Ireland and the Midlands region. Other awards handed out over the course of the two-day event, included overall ‘Student of the Year’. Within the Faculty of Engineering and Informatics, Sebastian Makowiecki took home the accolade, while Roslyn McDonnell received the award within the Faculty of Business and Hospitality. In the Department of Lifelong Learning, Karen Flanagan took home the ‘Student of the Year’ award. The Patricia Kearney Memorial Award was bestowed upon Richael Timothy within the Faculty of Science and Heath. Other notable graduates included RTE News Midlands Correspondent Ciarán Mullooly who graduated with a Bachelor of Arts (Honours) in Business and Social Enterprise, Leadership and Management and Shane Francis took home the award for ‘Best Student in BEng (Hons) in Mechanical and Polymer Engineering’. Shane is a prime example of the benefits of an applied, industry-focused education. Since his exams finished in May, Shane has been working for global MedTech company Boston Scientific in the capacity of Graduate Manufacturing Engineer and recently came back to Athlone Institute of Technology to participate in the award-winning institute’s ‘Jobs of the Future’ Career and Further Study Expo. Shane is just one of many graduates that have benefited from the institute’s close links with industry. As an institute, AIT emphasises the importance of work placements in producing work-ready, competent graduates and encourage business and industry to view work placements as a gateway for identifying and recruiting talent. As such, the college has cultivated a symbiotic relationship that has been instrumental in transforming the Midlands into a hub of multinational investment and innovation.